Robert Hogan gets a move on. Former also-ran Robert Hogan is now the world’s fastest golfer - officially the Speedgolf World champion - just six years after Padraig Harrington outscored him by 55 shots over just two rounds. The Wicklow native was just 21 when he opened with a whopping score of 105 in the 2007 Irish PGA at The European Club and while PGA Irish Region officials were not best pleased with the negative publicity, he refused to throw in the towel and added an 87 in the second round to miss the cut by 36 shots on 50 over par 192. 2013 World Speedgolf champion Robert Hogan. Harrington was five under at halfway in an event that saw 23 others either withdrew, retire or suffer disqualification. But Hogan, who was unattached at the time having spent a bried spell as an assistant to Robert Giles at Greenore, refused to slink away from the scene of the carnage. It was a brave move on a terrifying course set up to prepare Harrington for The Open at Carnoustie, which he won the following week, but Hogan would not give in. It was paramount to masochism. Former Olympic 1,500m medallist Bernard Legat checks his watch after finishing. Picture © Mike Stahlberg/For The Register-GuardIn the first round, he started on the 10th with a quintuple bogey nine, made a 12 at the par four 17th and closed with an 11 at the ninth. He almost ran out of balls, which led enquiries by the Irish PGA to make sure he had played with the same brand and configuration for all 18 holes. He had. They couldn’t disqualify him. Fast-forward six years and the now 27-year old has just pocketed $15,000 - a little less than Harrington got for winning that year’s Irish PGA - for his sensational victory in the Speedgolf World Championships at Bandon Dunes on Sunday. Without fear on contradiction, Hogan would hammer three-time Major winner Harrington - one of the slowest players around as Rory McIlroy gleefully told Tiger Woods before their exhibtion in China on Monday - if they were ever to face off at Speedgolf. “In speedgolf, a competitor’s score is the total of the strokes played and the elapsed time covering the 18-hole course. Saturday, Hogan had raced the par-71 Old Macdonald course in 39:31 while shooting 77 for a score of 116.31 to take an eight-point lead into Sunday’s final round. “Sunday, Hogan again posted the fastest time in the 24-player field, and his speedgolf score of 120.24 gave him a two-day total of 236.55 and a six-point victory over former Stanford golfer Eri Crum of Boise [an ex college team mate of Tiger Woods]. There you have it. It’s an incredible accomplishment and all the more impressive considering the professional field - there was also an amateur section - featured Olympic athletes Nick Willis and Bernard Lagat. Rob Hogan shaved precious minutes from his score by putting one-handed, allowing him to never set down his golf bag. Picture © Mike Stahlberg/For The Register-GuardHogan was in transit yesterday but his personal website - http://www.hogangolfacademy.com - explains that his personal best is 117:28 (74 shots in 43:28) which he recorded to win the 2013 Oregon Speedgolf Open at Quail Valley Golf Club earlier this year. His opening round of 116.31 (39:31 to shoot 77) was therefore a personal best and it was no wonder he was thrilled afterwards. 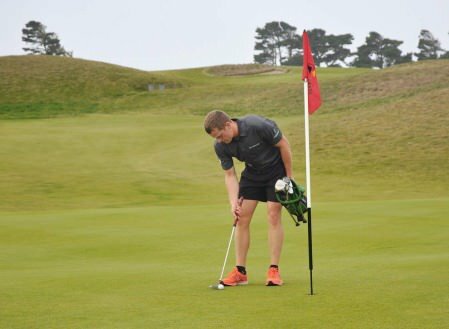 “That was the first time he tried one-handed putting, using a shorter putter and holding his golf bag with the other hand, to save valuable time on the greens. It cost him strokes then, but he stuck with it and putted well here this weekend; he’s also fitter than a year ago. As it turns out, he was almost right. He now runs the Hogan Golf Academy at Cregmore Park Golf Club in Co Galway. 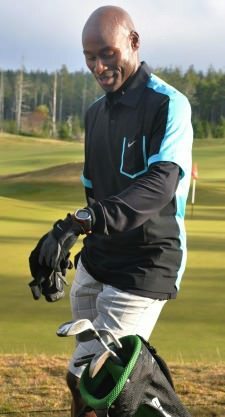 He provides the full gamut of coaching services you’d expect of any qualified PGA professional but you’ll want to ask him about Speedgolf. In case you are wondering, he can run five miles in 30 minutes, his best score [in under one hour] is a 73 at Bray and his fastest 18 hole round took just 31 minutes at Foxrock. Speed golfer Rob Hogan defended his title at the Eastern American Speedgolf Open at the Foundry Golf Club in Virginia. Irishman Rob Hogan won the British Speedgolf Championship at Dale Hill Golf Club on Sunday. Robert Hogan in action in Virginia last weekend. Pádraig Harrington and Graeme McDowell will readily admit that they are not the two fastest golfers on the planet. But while their deliberate rounds at last week’s Irish Open exasperated onlookers, there’s an Irish golfer out there who doesn’t hang around.